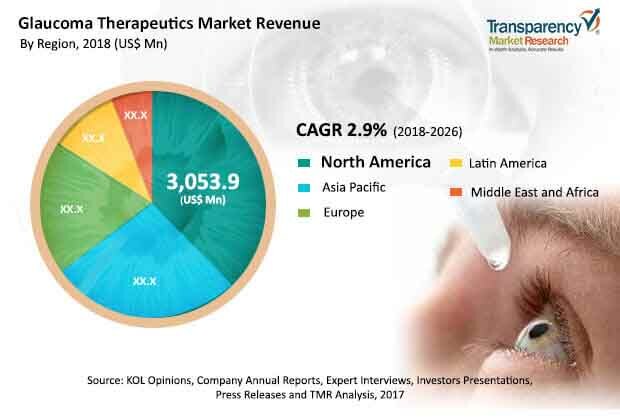 Transparency Market Research (TMR) has published a new report titled, “Glaucoma Therapeutics Market - Global Industry Analysis, Size, Share, Growth, Trends, and Forecast, 2018–2026”. According to the report, the global glaucoma therapeutics market was valued at US$ 5,932.6 Mn in 2017 and is projected to expand at a CAGR of 2.9% from 2018 to 2026. Increase in prevalence and incidence of diabetic disorders, rise in geriatric population, improved health care as well as health care infrastructure, and introduction of combination therapies are anticipated to propel the global market from 2018 to 2026. North America and Asia Pacific are expected to dominate the global glaucoma therapeutics market in the next few years. This is attributed to the well-established reimbursement policies by private and government health care institutes. According to the American Glaucoma Society, over 27 million people are affected with glaucoma in the U.S. alone. Players operating in the global glaucoma therapeutics market have made a series of strategic acquisitions, which contributes to the increase in their market share.